Harry started the first week demonstrating with his horse, Sandy, at our request. The following are my notes from that session. I have edited them in many places to make understandable phrases and sentences. Direct quotes from Harry will be in parenthases in "bold". Sandy is overconfident -- he has ideas how to run things. He has strong thoughts and struggles with giving them up when Harry has an idea that differs from Sandy's. Then when it's over, it's over, like after a tantrum. Sandy has let go of his ideas and holds no lingering bad feelings, no resentment, no caution, nothing. These things are not personal but we take them personal. It's about whether he got his thought to come through. The more times he lets go of his thought, the easier it is. People don't see the things horses do and see how often horses keep their thoughts, then letting go becomes harder for those horses. Decision whether to block a horse's hurrying off or not or go with him? If really worried, might go with him for awhile. If just feeling good and blowing off energy, might block horse. "Always start with what you're going to end up with." Harry uses his energy up and down to guide what he wants from Sandy. Very little hand action. 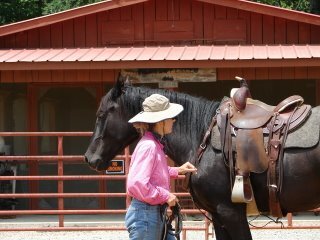 He didn't attack the problem of Sandy's attention with other horses outside the pen, but got Sandy working with him. Beneficial to get the horse with you first, before saddling if horse is upset about something. Pre-saddling groundwork can be invisible to someone else but he's assessing horse's readiness -- to be caught, to come through the gate, to stand for saddling, etc. May result in spending more time in round pen or such. Being particular all the time -- consistent from start to finish all the time he's with a horse. Horse being ready, ready to get prepared to go any moment you ask. Prepared to use his hindquarters to support his front end, instead of horse getting ready to come forward and person moves out of his way. That first step from halt, you can be asking the horse to step to the side... shift weight back then step front end around to the side. Mentally on a circle versus walking in a circle around someone even if the horse's mind is outside the circle. Fix: when horse gets straight, ready to go out, have him give his hindquarters; do this a few times until horse gives up thought to head out and is ready to come back mentally. Get that thought to come back in here, eventually get thought back to circle for a step or two. "Take your feet out there, but don't leave me." Can work on leading and getting shoulder over. What does Harry do to get ready? The same thing you'd do to get ready to get up out of a chair. Reins are here for a reason: to direct a horse's thought. Take your thought to the right then get ready and then horse moves his body to the right. Demonstration of using the reins for turns on hindquarters and turns on frontquarters using a stick or whip in hands, representing the bit which is there to influence the horse's thought. Use the bit to influence the horses head, and the horse will shape his body. You can do this with legs, too. Learn to do it with reins alone so you're effectively using reins as best as they can be used. Nagging = repeatedly asking and nothing changes. Getting a change is not nagging. Are they thinking? Trying? Getting ready to do something? Wait, it's a good thing when they're searching. If you know they know and you feel them sucking back, then you might come in with your leg. b. Is horse worried abouat transition and tenses up then gets crooked and can't get lead? a. Balance trot better if it's a physical thing. b. Get confident about transition then address straightness. Rounding up and coming together is not a high degree of collection but it's in the right direction. If horse is resistant to bit, no need to drive a horse gorward. Let him stop and work it out. When he's correct, encourage him forward with leg as collect up a bit but not if he starts resisting the bit. Keep using whole body for forward. Might encourage forward but not drive forward. Try staying forward when I pick up the reins... Give to bit and step under stronger. If horse is going to push or lean on reins, don't give until they give, right from the first ride. We set a horse up to be resistant: pull on rin, horse pulling on rein, but release because a horse headed to the direction youwant. We overlook all those little spots. "I question how good it can feel to a horse to give you less than their best, so I ask for their best." Round pen with Sofia: online first because she gets so lost away from me. Circle, getting her 'straight' on the circle'. Sometimes asking hind away and sometimes asking head toward me. Me standing in front of her, sending her mind to left or right without feet. Sending mind then feet a step or a few steps. More circling then offline, sending and drawing or allowing her back. She got more lost so Harry coached me to wait for her to make the decision to be with me. It felt much better when she came to me secondary to her choice rather than compliance with my asking. Harry urged me NOT to use my body language to influence her movement. A little startlement factor can help a horse settle -- it gets his mind here. Muscles of topline get hard and flat when used (not desirable!). Developing a look to topline but not developing the muscles of the topline. Don't step toward horse with intention of doing something to the horse. Instead step away and make a commotion and see if you can draw his attention. If you are going to buy a horse, present something that they've not known before and see if they panic or try to think their way through it. Horse can get confused and think he's being chased unless you're clear about transitions up and down and releasing and lots of transition changes. He'll gain confidence and feel better. Don't criticize the horse for looking around but do give the horse a line to ride. 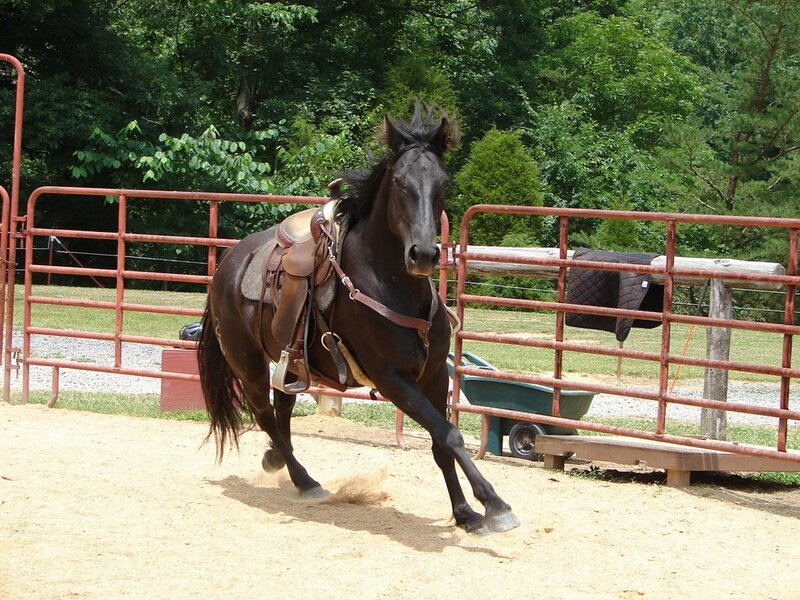 Helping horse lift back: horse may get short strided as he's getting ready to lift back. Follow through until he raises back even if stride shortens, and even if horse stops and backs.